Down through the ages, man’s best friend has often filled the role of ’sidekick,’ whether it be the family dog, a guard dog or a member of a police squad’s K-9 Unit. But, most recently that term took on a more literal meaning. In a new initiative that includes sidecars, doggles (doggie goggles) and road trips, ’sidecar dogs’ are becoming the new rage. So much so, it’s spawned a documentary about rescue dogs who were specifically recruited for motorcycle sidecar traveling. The cast includes more than a dozen drivers and their favorite pooches. 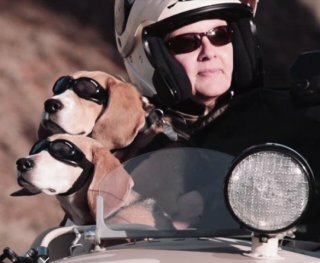 ‘Sit Stay Ride: The Story of America’s Sidecar Dogs’ is a delightful and inspiring documentary film about motorcyclists and their beloved canine co-pilots. Thoroughly entertaining, the film follows a number of sidecar-riding duos, trios, and foursomes as they travel together– sharing the experience of being out and about on a machine as unique as it’s passengers. Even though none of the dog owners met during filming, "we all spoke with one voice," ex-Air Force officer, JD Whittaker told NBC News. 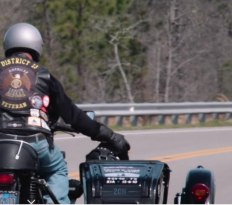 "Such a diverse group of people, a diverse group of motorcycles, a diverse group of dogs, and we're all speaking with one voice." "Kids grow up and, of course, they want to bring their dog," said Whittaker, one of 18 riders and their dogs featured in the Kickstarter-funded documentary. "When the kids are gone, all you've got left is the dog." Philippe Murat, another cast member who rides with his wife and two beagles has figured out why this activity is so addictive: "There are two reasons to have dogs in your sidecar. One is because you don't want to go anywhere without your dogs. And the second reason is because it's so cool!" In an email to NBC News, filmmaker Eric Ristau said: "Sidecars are such an antiquated, unusual form of transportation. 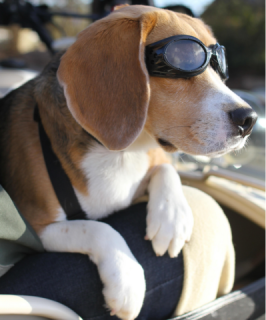 The image of a dog wearing doggles, sitting in a sidecar and having a blast riding down the road was just so refreshing and joyful." Albert the beagle seen here, complete with "doggles," tools along the streets of San Francisco with his owners, Philippe and Regitze Murat. They collectively commandeer a vintage BMW sidecar, which have long been associated with rescue dogs. In fact, the Ristaus dedicated the film "to all rescue dogs, on motorcycles or off," and they're donating all proceeds from the theatrical screenings and 25 percent of digital and DVD sales to dog rescue organizations. Almost makes you want to go out and start shopping for a sidecar, for you and that special companion, doesn't it?